We all love new Nexus accessories right? After all, Google doesn't have a spotless track record with providing accessories for their own line of phones and tablets. 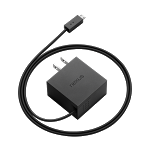 Today, Google added one item to the lineup - a Nexus Charging Accessory. The don't-call-it-a-travel-adaptor accessory is a basic micro USB cable with a block, just as you'd expect. For reference, the accessory is listed as a 1.8A adapter. The Nexus 5's stock adapter is 1.2A, the new Nexus 7's charger is 1.35A, and Samsung has been shipping 2A adapters of late. So while this may be a bit faster than your other Nexus chargers, you might not see a mind-blowing boost in charging speed. That said, the charger is only $14.99 in the US. It's also confirmed to be available in the UK and Canada, though we can't be certain just yet how broad the rollout is. Is the charging accessory available in your country? Hit the link below to grab one for yourself.